All A Bunch Of Momsense: Sunday Sunday Sunday!! Ok, so it's Sunday, which means lots of stuff around here! The winner of the Imaginative Play "Lets Play Veterinarian" set, sponsored by CSN Stores! Shoot me an email, my dear, you WIN! 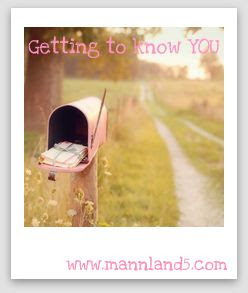 Next up is our fun Sunday Hop from Keely at www.MannLand5.com - Getting to Know You! Keely and Crew are in the middle of moving -yucko! I swore to my hubs when we moved the last time that I was DONE. Never moving again. Periodically, he'll say things about "our next house" and I just laugh and ask if that's the one with his next wife! I think he thinks I'm kidding! Any whozle, GTKY is a fun way to learn more about each other, so you should play too. Keely's got all the scoop over there - check it out! 3. Beach house or Lake house? 5. Did you wear braces? 7. How many times have you moved in your life? 8. Would you rather cook or clean? Well, I professionally neglect ALL of it, but if I had to pick, it would probably be my feet. Yes, please! Really, I love being near bodies of water, and I'm not real picky. I love the ocean, I love sun on my skin, I love being on a boat, or a porch overlooking the water early in the morning. I really could be happy in either situation, but if I had to pick I gotta go beach house. I did, just on my bottom teeth, and not for long enough. I wasn't so concerned with the "look" of straight teeth as I was dealing with this ONE TOOTH that was angled in such a way that it rubbed the inside of my lip funny and hurt. Once that was better, I was good. Plus, my orthodontist was a real RAWR, so I was DONE dealing with him, thankyouverymuch. Uh.. Wow. Just one? Ok. I'm going to go with Clara Barton. Her story is one I've admired for many years, and while I in no way imagine that she had any "easy" days, sometimes is those hard ones that best form who we are. To many in my mind! But Keely's sure got me beat. Nine times. Cook! I love the cooking, its the cleaning up that's not my favorite! Then, I have to work on books for a client. And in there might be a little basketball, and a race, and some food! Yay me! I love winning and since my tea from Tim Horton's Roll Up The Rim To Win was a big fat loser, as was my lottery ticket for last night's $41mil draw...I am THRILLED to be a winner here!! I've moved 4 times and that's too much. We will eventually need to move from our house here and just the thought of it makes me feel barfy. I love Getting to Know You Sunday, its a great time to meet new bloggy friends! Loved reading your answers, and your blog is too cute! feet seems to be the biggie here. Actually, all good answers - I love reading what all my bloggy friends have to say! Hang in there during your busy season! Happy Sunday! I would rather clean but no one mentioned dishes in that!!! I hate doing the dishes and would rather cook any day!!! i love getting to know you on sunday! i keep saying i want to play along, but sundays really aren't a blogging day for me!